Medium format cameras came mostly in two styles: folding cameras and pull-out or collapsible lens cameras. The latter gained popularity in the 50s and many companies made cheap versions with simple shutter and low-quality lenses. However, it wasn't all bad and there were several interesting models, some of these you'll find here. They used 120 rollfilm and can thus still be used today. The Altuca was built by Altissa, the same company that produced the Altix range described in detail here. It was a simple camera with top-mounted viewfinder and body-mounted shutter release. The shutter is the self-cocking type, the lens was a Ludwig Meritar 75mm f/3.5. Only very few changes happened during production of the camera. 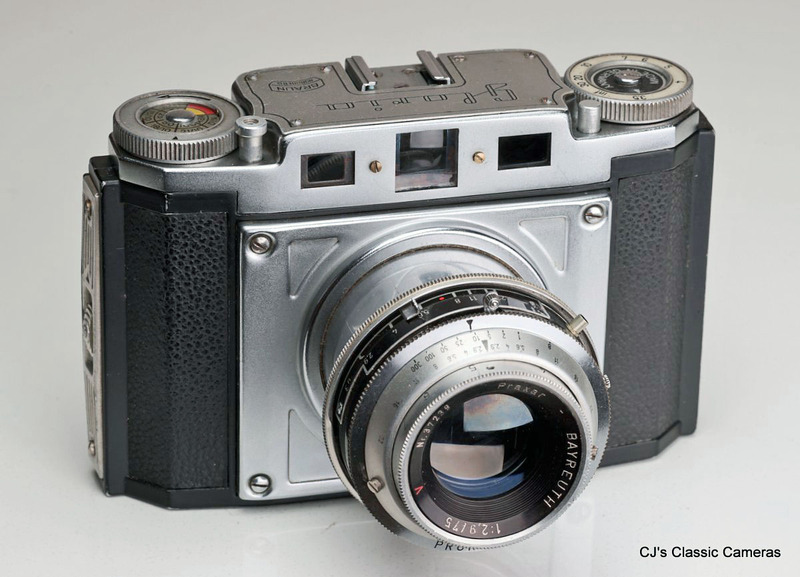 Early models like the one below had a distance release socket on the shutter, later models had one next to the shutter release button. 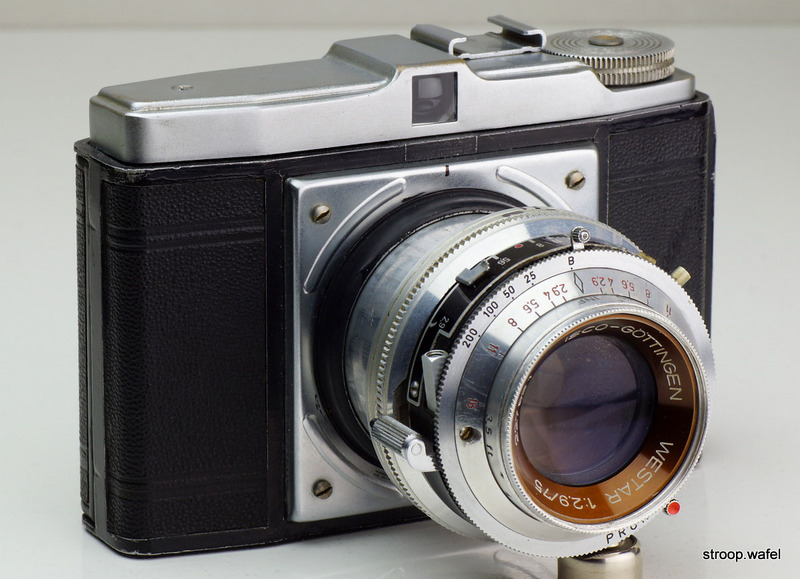 The later models also had a double exposure indicator next to the wind knob and a focus marker on the shutter plate. I have seen two different ones, either a red V or a sort of red lollypop sign. The Altuca must have been produced for several years based on the range in lens serial # (798k - 1124k), although information exists about lens dates of the Meritar lenses. The lens was also found on the Feca (serial# 950k - 1150k) and Beirette (serial# >1200k), but probably most well known as the standard lens on the Ihagee Exa. The earliest Exas have Meritars with serial# 750k and are from 1951. Based on the Exa lens data the Altuca must have been built from ca. 1951 to at least 1956, i.e., alongside Altix IV, V, n and nb models, perhaps in small batches based upon demand. Early Altissa Altuca with Ludwig Meritar 75mm f/3.5. 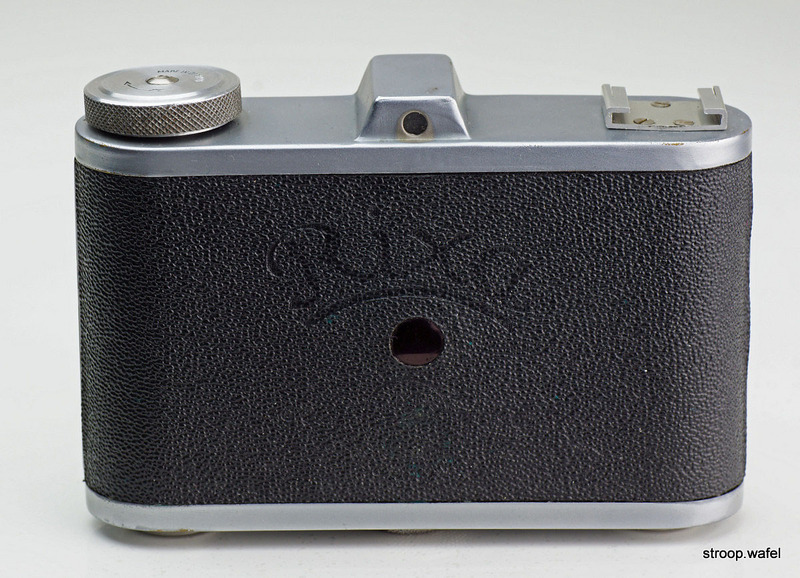 The Rixa is probably the rarest of the cameras shown on this page. It was made in the early 50s by Rixa Kamerabau, Ludwigsburg, which was a restart of the company Münch, which went bankrupt in 1950. The camera is therefore usually known as the Münch Rixa. It came in versions with f/3.5. f/4.5 and f/7.7 lenses, which gave the different models their names. The shutter release was on the shutter itself, which on cameras with physically long pull-out lenses like this is probably not a good idea, being extra sensitive to camera movement. Rixa 4.5, probably the simplest looking camera here, but it had a nice Ennar lens and a shutter with a decent range of speeds. Rear view of the Rixa, showing the name. 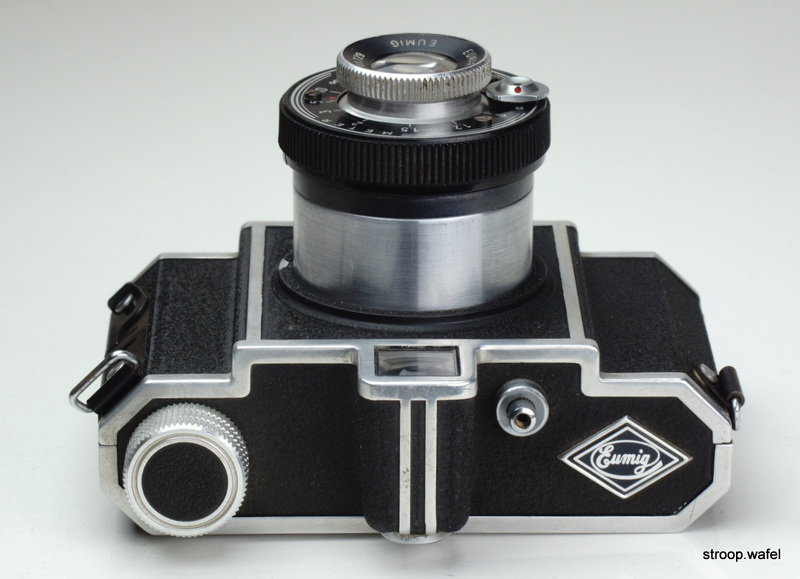 Another rare camera is the Ising Isis from around 1955. It was made by the same company which also produced the Ising Puck as well as a box camera called the Pucky, but I am not aware of any others. The Isis was a decent enough quality camera with body-mounted shutter release and a sturdy lens base, often the weak point in this type of cameras. An Ising Isis with dented top housing. 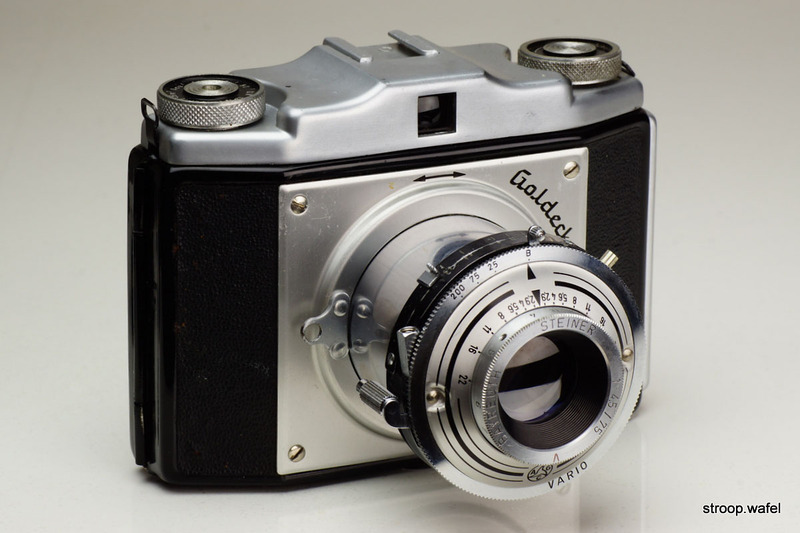 Goldammer made a range of fairly similar 6x6 rollfilm cameras with names like Goldeck, Goldixette and GuGo. They came with a wide range of lenses and shutters, from simple meniscus lenses with fixed aperture and single shutter speeds to the more advanced models like the one below. A Goldeck with Steiner Bayreuth 75/4.5 lens. These lenses are rather uncommon but was frequently found on Rodehüser Pantas, like the one below. A nice feature of this particular model was the locking mechanism for the shutter, which avoided accidental exposures when the lens was collapsed. Braun was probably best known for their Paxette range of cameras, but they also made several medium format cameras including the Paxina and the Gloria. 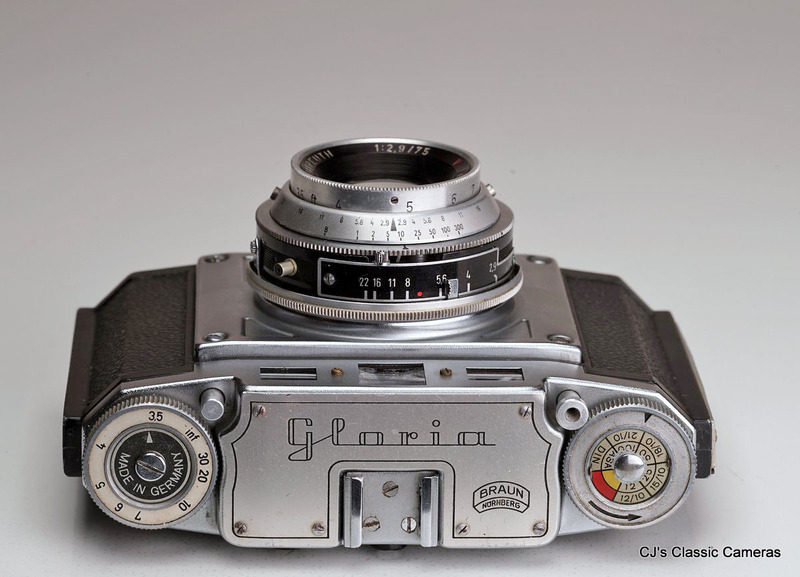 The Gloria was one of the few collapsible lens cameras with an uncoupled rangefinder. It featured a Praxar-Bayreuth lens, undoubtedly made by Steiner, lenses by which are found on quite a few cameras on this page. A Braun Gloria with coated Praxar-BAYREUTH 75mm f/2.9 lens in Prontor-SVS shutter. Top view of the Braun Gloria. Move mouse over the image to see the lens extending. The lens is locked in both positions; the button next to the rangefinder dial needs to be pushed to unlock it. 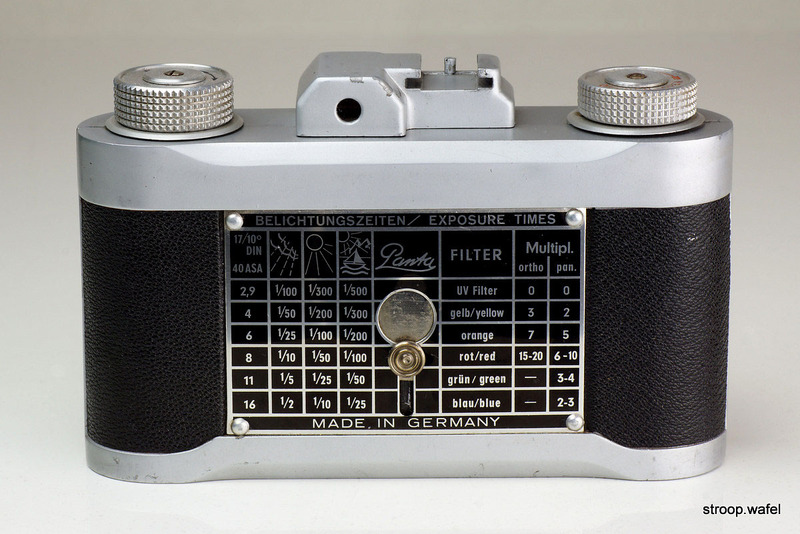 Vredeborch was a small camera maker based in Nordenham (northern Germany) that was mostly known for the many box cameras it produced after WWII. 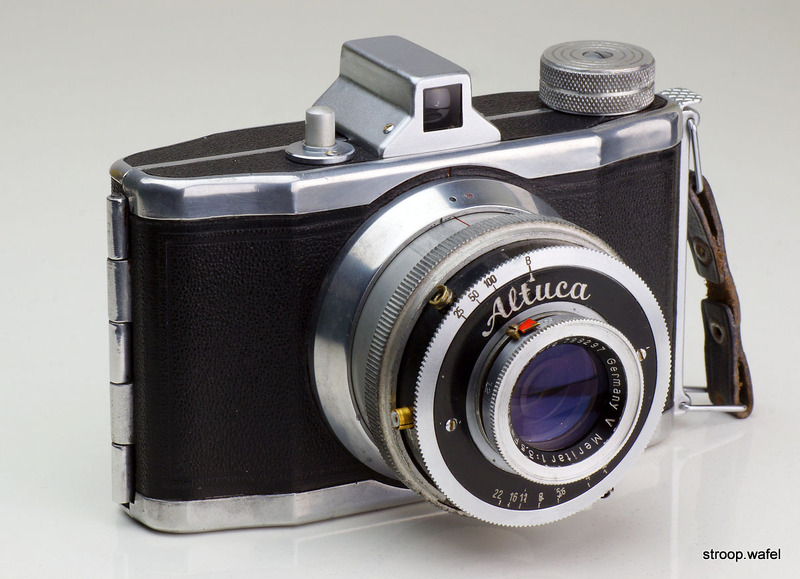 It also made a simple 6x6 camera, the Felica, and a 35mm equivalent, the Felicetta. 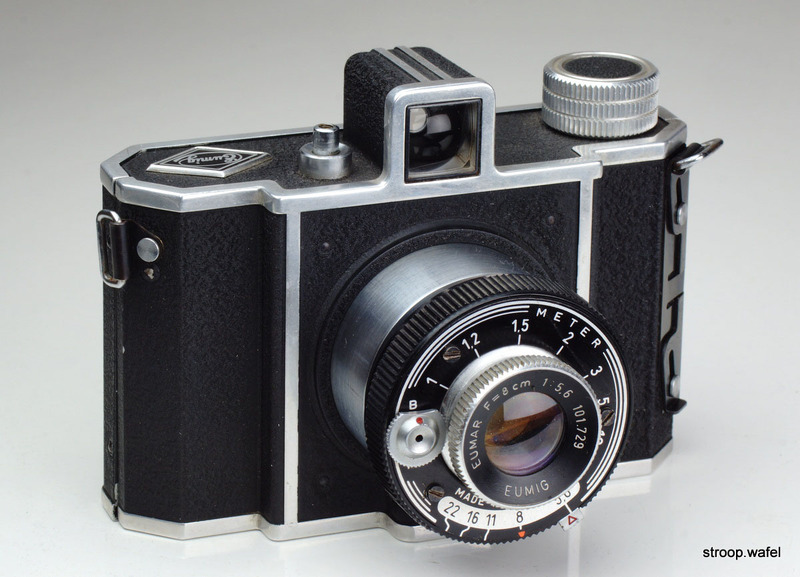 The Nordina was also a 6x6 camera which took 120 roll film, but it was much better specified than the Felica, as it had a Vario shutter and a Steiner Bayreuth pull-out lens. 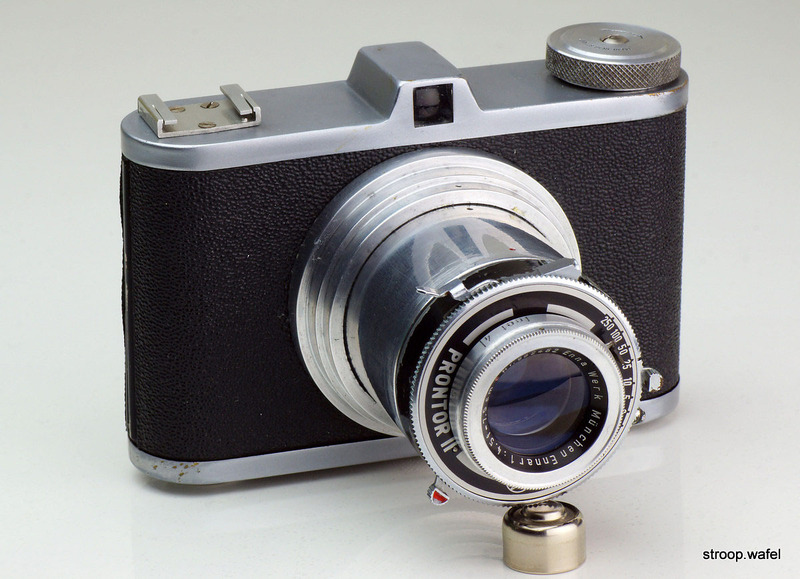 An early version had a simple viewfinder integrated in the top housing not unlike the Rixa above, a later version had an enlarged top housing. This change seemed to have been largely cosmetic, as the viewfinder size was the same. The rather handsome Vredebroch Nordina equipped with Steiner Bayreuth 75mm f/4.5 lens. These lenses are rather uncommon but were frequently found on Rodehüser Pantas, like the one below and occasionally on Goldammer 6x6 cameras, like the Goldeck above. 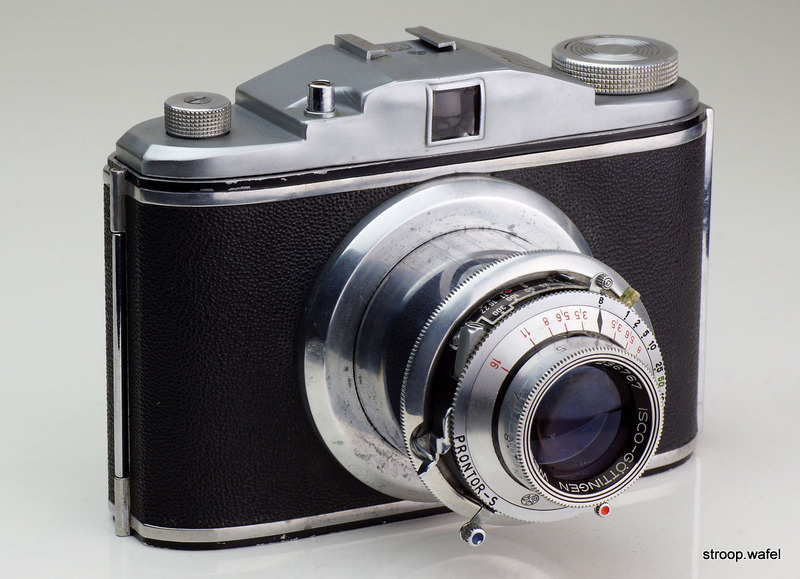 The Dacora Digna was a rather more common camera and was produced from 1954 to 1959. It came with a range of lenses from a rather poor Achromat f/8 in a single-speed shutter to a Enna Correlar or Isco Westar f/2.9 in Pronto shutter. In contrast to the other cameras here, the lens is pushed forwards and held in place by a spring after slightly turning the lens tube. Dacora was not really a brand known for their great cameras, but mainly as a producer of cameras for other brands, including many Ilford-branded cameras. It mainly produced cheap-end cameras but managed to survive into the 70s. A Dacora Digna with good specifications: a fast Isco Westar 75mm f/2.9 in Pronto shutter. Unfortunately it lacked a body-mounted shutter release. Eumig was a small but successful company from Austria that mainly produced electrical equipment such as radios, as well as film cameras and projectors. After WWII it tried its luck in the photo camera market, like many others, and introduced the Eumigetta in 1951, a 6x6 120 roll film camera. It was an experiment that did not last long and after a few years production stopped. However, the company did continue to be successful in making movie cameras until the early 1980s. 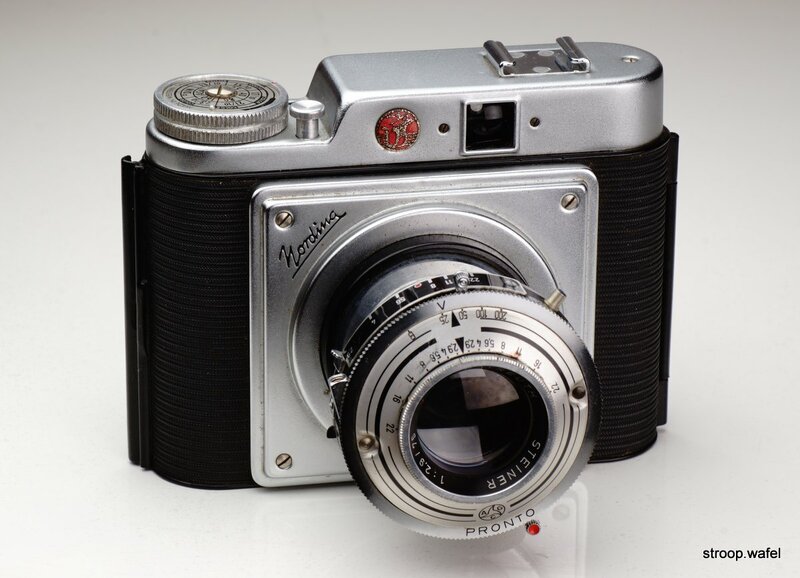 The Eumigetta I was a sturdy camera with a distinct angular look, bold metal edges and a prominent square viewfinder. It had a collapsible pull-out lens and a body mounted shutter release. It had a few interesting features, one of them being the spring-loaded red window cover (why had nearly no other camera maker thought of that? ), another was the strap lug which also functioned as the back cover release latch. 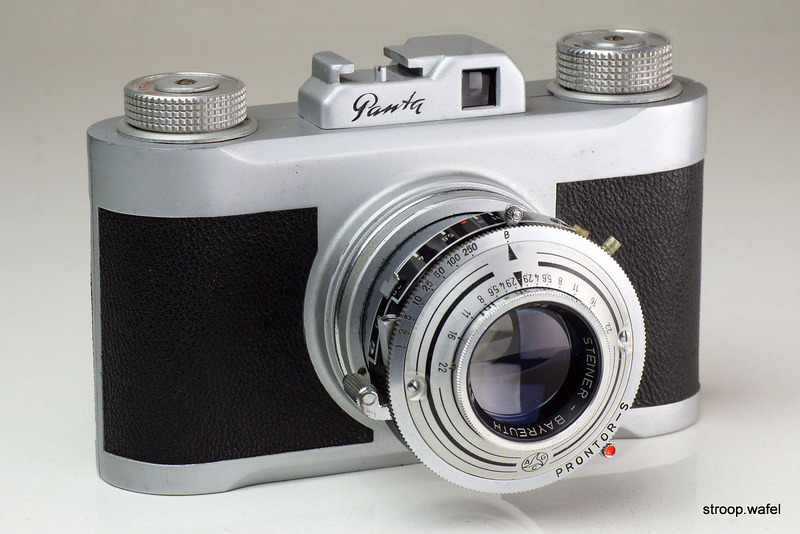 A later model, the Eumigetta II, had a more rounded body and a wider top cover, which gave the camera a much more elegant look. It also had a better shutter with more speeds as well a faster lens. About 8,000 Eumigetta I were produced vs. 16,000 Eumigetta II. A Eumig Eumigetta I with Eumig Eumar 80mm f/5.6 lens in a self-cocking single speed shutter. Top view of the Eumigetta I with Eumig logo. The Panta was the king of collapsible lens cameras. It was well-engineered and well-built with a solid aluminium body. It had easy controls to pop off the back of the camera and to wind the film. The only flaw was that the shutter release was not on the body but on the shutter itself, which makes the camera more susceptible to shake. Also, the viewfinder is rather small. It came with a variety of shutter and lenses, all of them of high quality, the most desirable probably the Ennar. Several versions with slightly different cosmetic details exist, but in essence they were all the same. The Panta was the only camera Rodehüser built. The story of Rodehuser is an interesting one, as its founder ended up in prison because he had acquired the money to set up the camera factory illegally from post-war rebuilding funds. Camera collectors will probably agree that it was money well spent! Rodehuser Panta with coated Steiner-Bayreuth Steinar 75mm f/2.9 lens in a Prontor-S shutter. On the back the Panta featured an elaborate exposure table as well as a spy window for film transport. 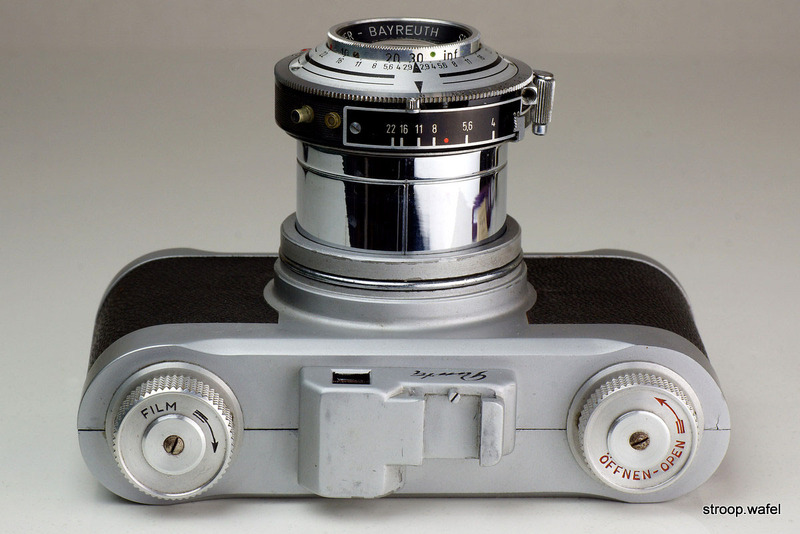 Many roll film cameras have only one knob, the wind knob, but the Panta had an additional one for opening the back. 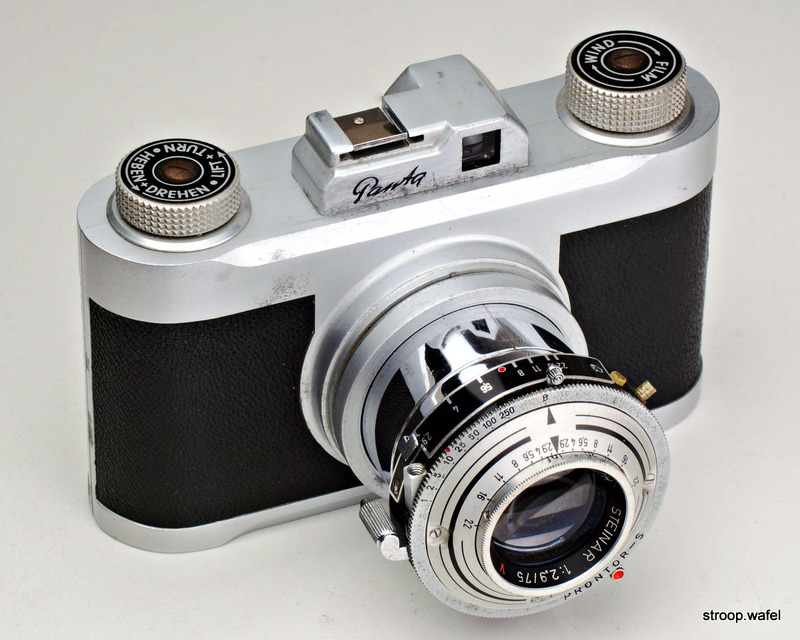 A slightly newer version of the Panta, with updated wind knobs and accessory shoe, but the same lens-shutter combination.